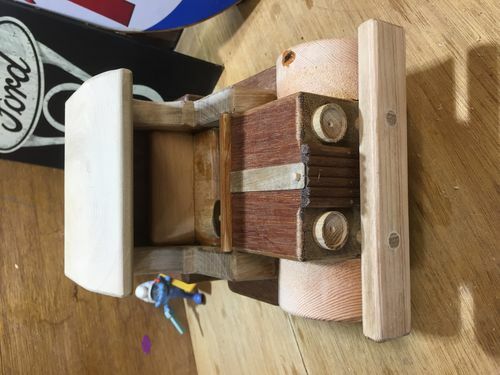 Built this vise primarily to hold irregular shaped items. The fret filing and the small bit of chisel work on the banjo went quicker and easier with this setup. Vise is made from hem fir with “ultra-suede” jaw faces provided by my wife from her fabric collection – we will see how it wears. The 3/4 inch diameter acme threads with only 6 threads per inch spin freely for quick setup. 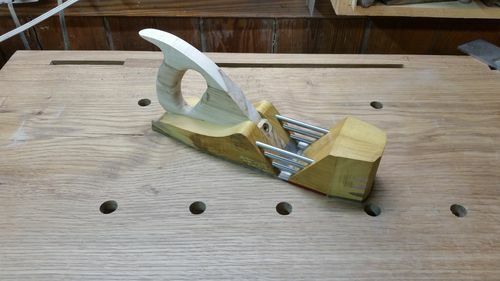 The jaw opening is 3 1/2 inches, but the threaded rods can be pulled out another 2 inches if needed for a 5 1/2 inch opening. Another Andy style art box. This one was made for an old friend of mine. The 3/4 inch divit in the inside of the lid is for a 2019 penny. I like to put in a penny for the year it was made, but this time, it took a while to get ahold of a new penny. 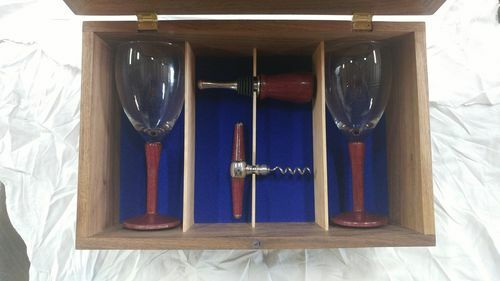 The wood is purpleheart and holly, and the inside boxes are maple. The monogrammed lid is held on with rare earth magnets. 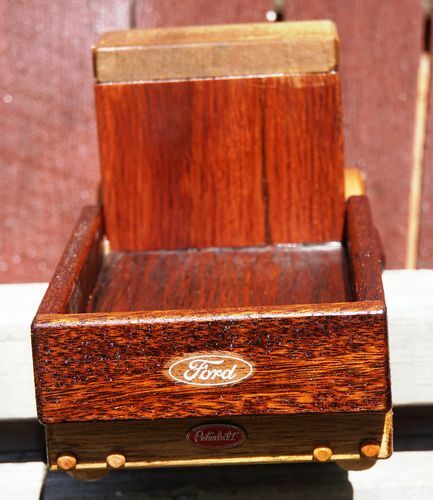 Mahogany and maple cigar ash trays. 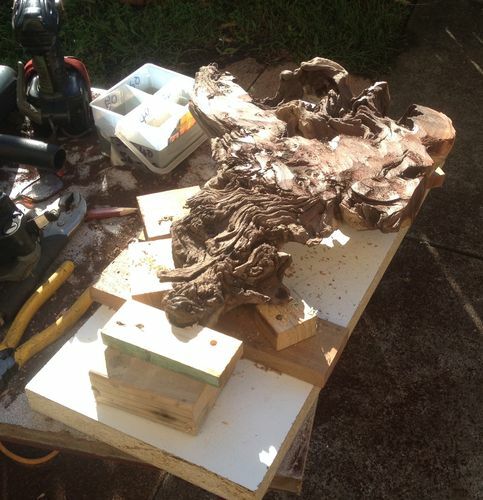 Everything was done on a tablesaw, including the circular shape of the ash tray, as well as the bowl cut. 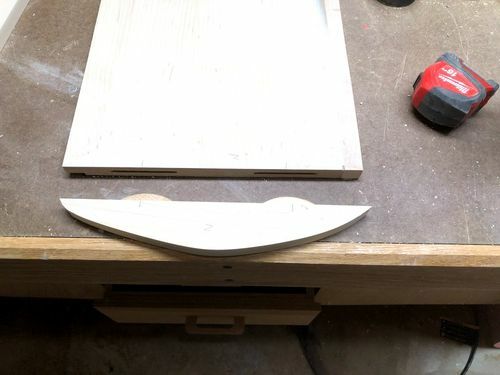 Used a cross cut sled to cut the edges, then made a jig to rotate the piece over the saw blade to get the concave shape on the inside. It was the first time trying this technique and wasn't sure how it would work out, but I couldn't believe how easy it was and how well it worked.I used my drill press to spin the ash tray while I held sandpaper against it to get a smooth and even surface....and if you don't drill holes for the cigar holder, they make nice candy dishes! 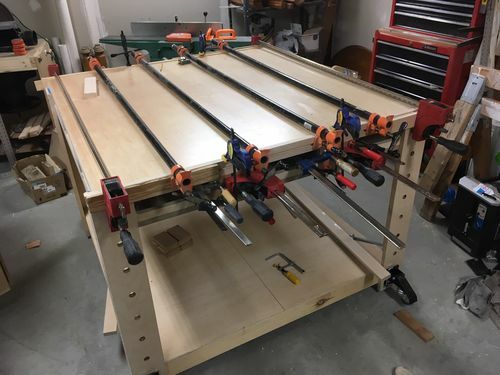 Just completed a stand for my recently completed bench top jointer. 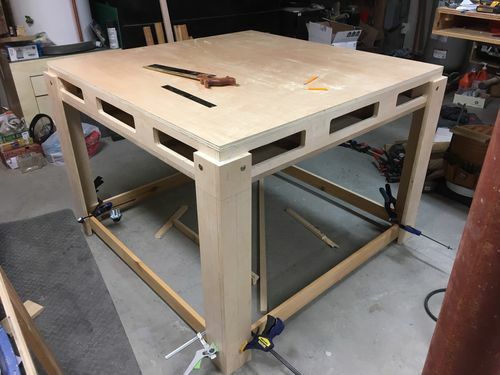 The entire frame work is constructed using 2×4's, held together by glue and pocket screws with 1/4 launan plywood inserts accented by 1.5 trim.The base dimensions are 38 L x 15 W x 24.5 H while the top measures 38 L x 15 W x 1.5 D.For a finish I painted the lower frame white and all of the trim and drawer pulls expresso brown, then finished all the plywood with a coat of gloss polyurethane. My favorite Chef's knife was ready for retirement…..the handle was disintegrating. 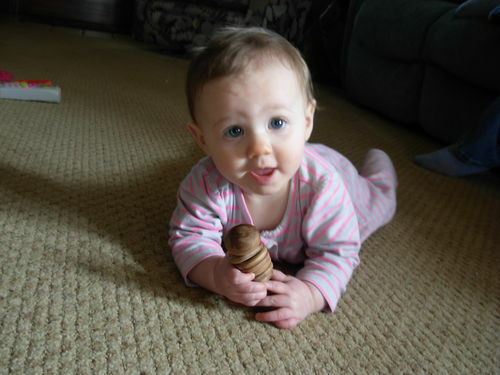 I nursed it along for a while, and then decided to try to rehabilitate it. 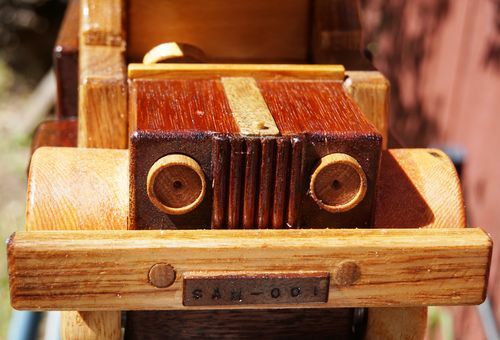 I had a piece of African teak...supposed to be water resistant….and a little time. The original handle was held in place by brass rivets, and I couldn't find any of those. 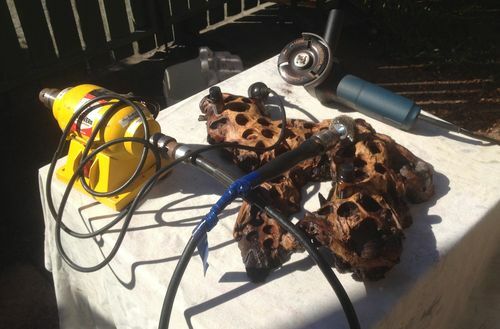 Instead, I got brass machine screws and nuts from my local hardware guy, and they worked just fine. 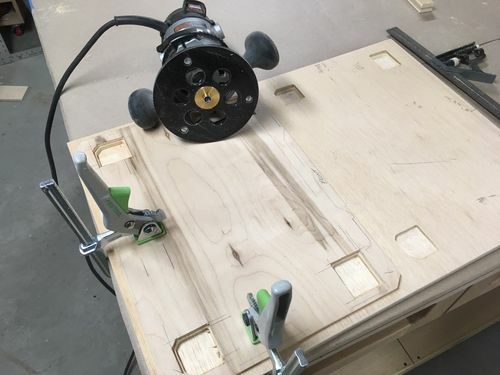 After sawing a kerf for the tang with my table saw and rounding over the edges on my router table, I carefully measured the locatiion of the hardware holes, drilled and then set the tang in place with epoxy. I let the brass hardware stand a bit proud and ground it down with my belt sander. The wood is treated to a few doses of mineral oil, and my baby is back in business. Very satisfying project! Just wanted to post a few pens I made recently! Wow. 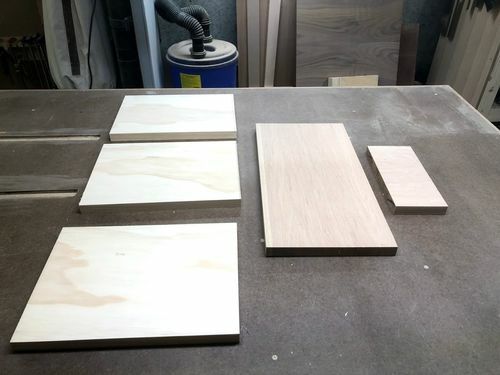 If you haven't made an end grain cutting board like this, you might want to store up some patience first. It was fun and challenging at the same time. 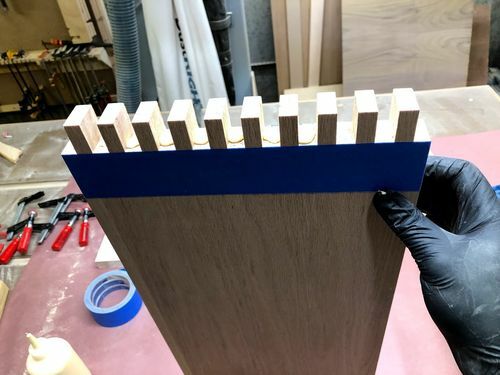 The 3-5m pieces are slick and try to move, when doing the glue up. I finished with mineral oil. What else do you call a plane that's yellow?Second iteration of a 12 inch panel plane in my signature style. 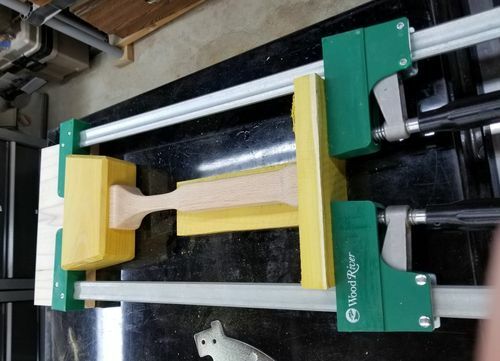 Laminated Osage Orange body with a curly ambrosia maple tote. As with my other planes, the sole, rods and cap are all stainless steel. Several updates/changes to this one. I've started using a steel throat block for better iron support and stability, this is the first one completed in that manner. You can see it in this progress pic. Other changes include insetting the tote, where the first one of this size was laminated clear to the rear and I now have a logo stamp to mark the planes. As with most new techniques & features, there has been a learning curve but it was worth it to develop an even better final product.Thanks for looking. Water based Sanding Sealer. 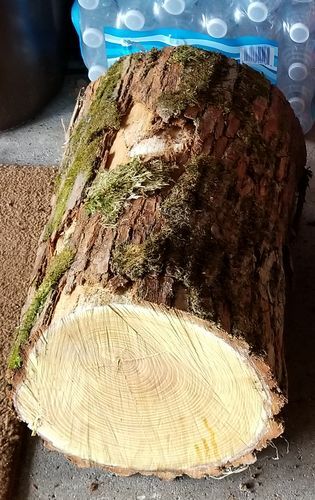 What sort of timber is it?...well I have no idea actually, but it looks OK. 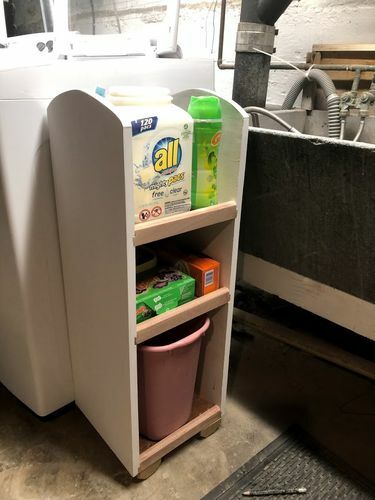 I had the screw and nail bins mounted on the wall. So much wall space I felt was wasted and we can always use more storage space. 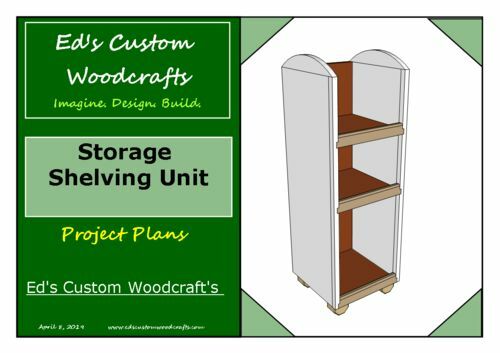 It is on a two by two 1 1/2 popular, popular face frame, 3/4 oak veneer and walnut door and drawer fronts. I had all of the wood except the 3/4 oak veneer. 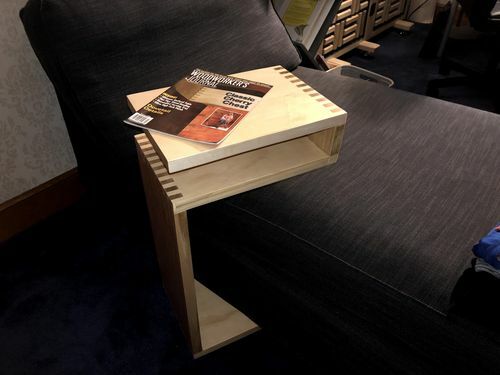 My wife has a home office that she recently purchased a Chaise Lounger , its a model that doesn't have any arms on it, so it makes it difficult to read or drink a cup of coffee at. So She asked me to come up with a idea of a table. 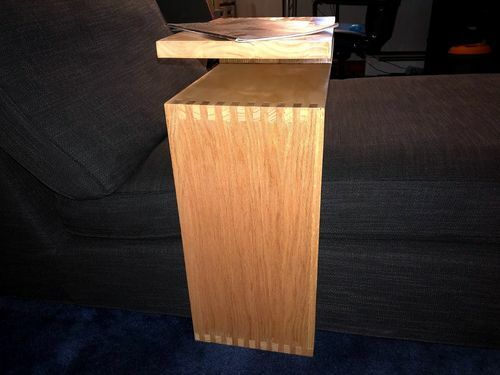 So I came across a lot of style's of table that would work great but something stuck out about this style of table and mainly it was the joint that was used to assemble it, its called a finger joint (box joint) and its simply a series of fingers and slot that when mated together forms an extremely strong joint as well as looking very attractive and not as hard to complete as say a dovetail joint. My blog detailing this project goes into a lot more detail but these are the steps I took in making this project, but please feel free to click the below links for he Project Blog and Complete plans on making it.Materials NeededI wanted to use by some 1” x 12” Oak and Maple woods to make this but my home center didn't have any so I opted to buy some 1” thick Stair threads so that is what I did. I basically ripped the bullnose edging of and I was at the races and for a fraction of the cost as well. Crosscutting the partsOnce I ripped the bullnose edging that was on the workpieces I turned to my crosscut sled to cut them to final size and to be honest I spent more time in this project in the glue up than any other phase. 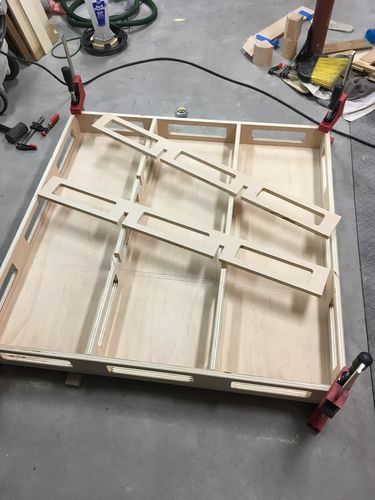 This project only had 5 parts to it. The Box Joint JigI actually didn't have a box joint jig for my table saw so I went about making one, I actually put a lot of time into this jig because I really like using finger joints in projects so I put together this little jig for the table-saw that I found on www.instructables.comwww.instructables.com Cutting the finger jointsWith the jig built it was time to cut the box joints, since there were only 5 pieces project this didn't take very long and within about 90 minutes I had cut all box joints into their respective parts. 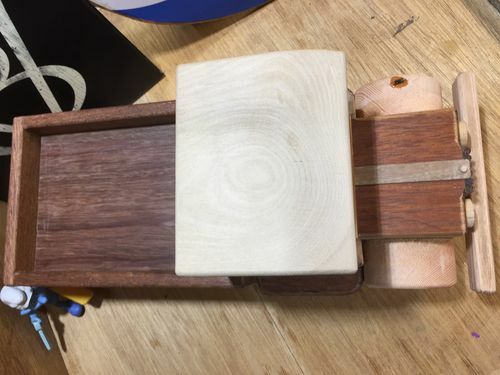 Some parts had both ends of a board jointed with box joints and other boards only needed 1 end with them. 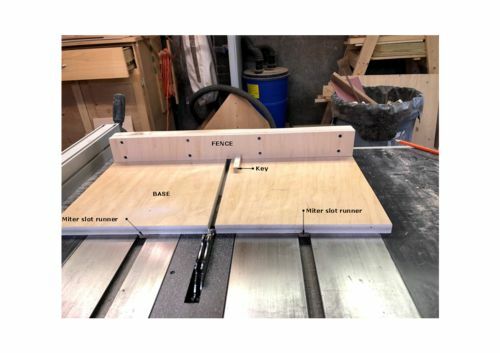 I actually needed to add a sacrificial fence to my fence on the jig because a couple of the boards were too tall and felt a little on the nervous side running them through the 1/2” wide dado stack.Dry Assembly & Clamping AidsTo aid me during the glue-ups I actually had another side project and that was to make some right angled clamping jigs I had some scrap MDF so I banged out about 6 of them to aid in the clamping of the table parts. It was crucial that all joints were at 90 because it only had 1 side to it and I didn't want the table tipping over. 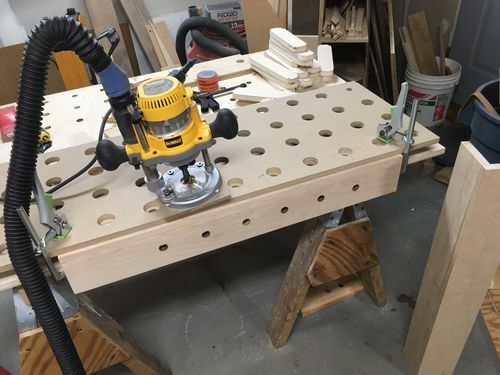 I also always do a dry assembly to rehearse the glue up and know were to add clamps. 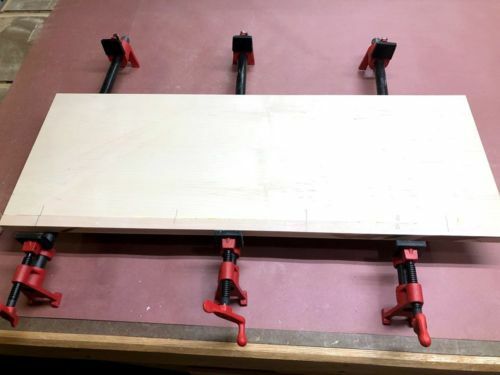 This table took a week to glue up because I didn't want to take a chance on working on a table section and the glue was not fully cured, so I added a piece of the table every day leaving the glue dry for 24 hours for each joint. 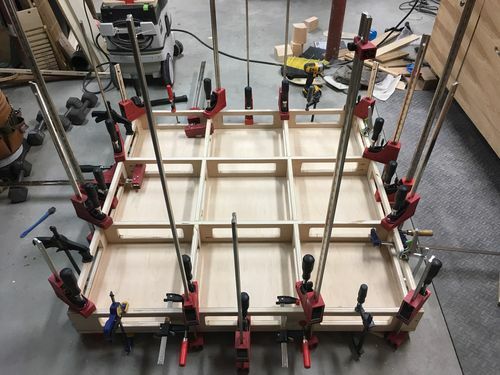 One section all clamped up.Glue-UpLike I had mentioned I glue up one section at a time so as that it had 24 hours to cure between project sections. I also used a few tricks to help me with limited cleanup of glue squeeze-out along the joint line, in theory you place tape adjacent to the joint so any squeeze out goes onto the tape and them once cured you just rip up the tape and you have a nice clean line, this worked great and I will be using this in the future. SandingIn between each glued up section I sanded the parts with 150 grit and finally once the table was assembled I used 220 grit that was probably overkill but I didn't have any other grit other than courser grits. Finished TableI finally applied 3 coats of Minwax Polyacrylic finish and sanded in between each coat and I have to say that the table came out great and the wife is very happy. Well that is all I have and thanks for reading, please feel free to check out my website where I blogged in more details and have plans for plans for for sale on my site. 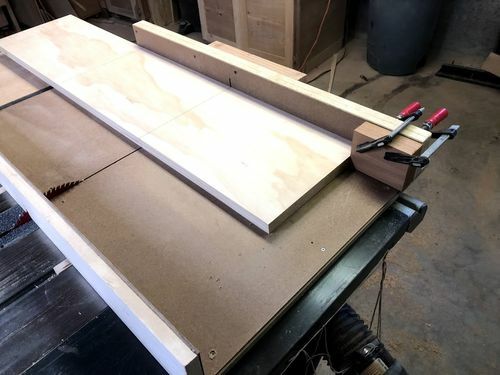 I wanted a way to temporarily attach featherboards, or a tall fence, or anything else I might think of, to my table saw fence. 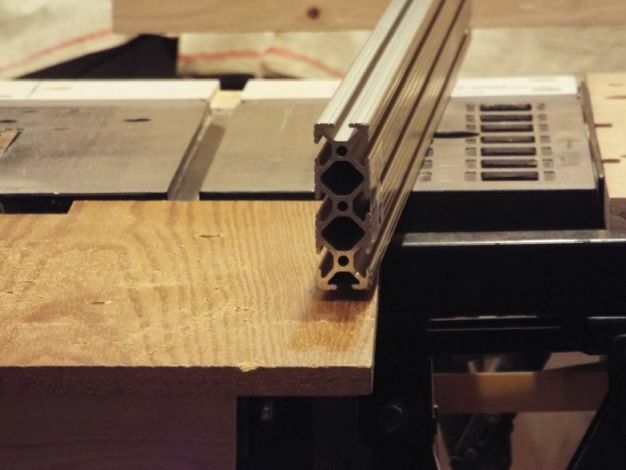 I saw people using aluminum extrusions clamped to their fences for this purpose, and I liked how it seemed to work really well, and it could be removed as easily as it was mounted. So I set out to find a good source for these pieces of metal convenience. 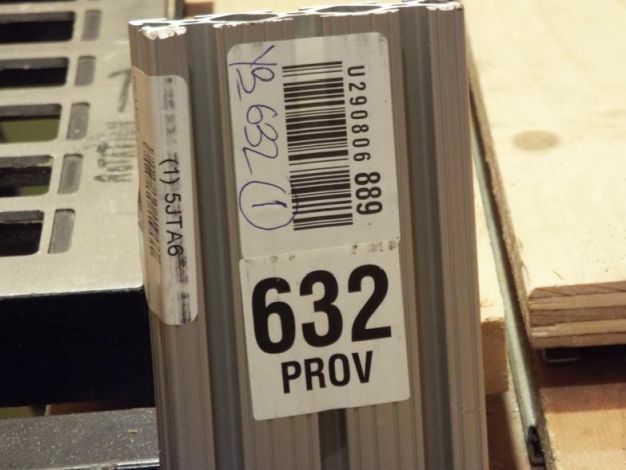 A quick google search for "aluminum extrusions", turns up dozens of companies that sell them, but I didn't want to have them shipped, because they can be bent in transit, and I wanted a six foot length, so the shipping weight and cost were prohibitive. I ended up going with Grainger. 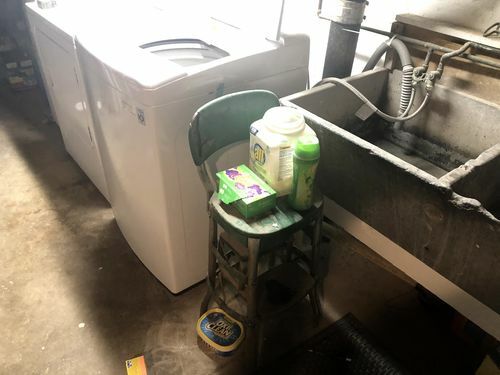 They offer lots of different sizes and shapes, and they have retail locations all over the U.S., and I found one just 20 minutes away. If you're in the Providence, RI area, it's located at 78 Jefferson Blvd., Warwick, RI 02888.
i didn't want anything too tall or too heavy. After paging through their extensive online catalog, I settled on item #5JTA6. I got a six foot length, that is 3" tall, and 1" thick. The three slots it has are each just a tad over 1/4" wide. It cost $54.64 ($9.11/ft), including tax, and there was no shipping charge, because I could just go pick it up once they notified me it was ready. After I got it home, I measured my fence, and cut an equally long piece from the six foot length using a metal cutting chop saw. It cut like butter. You will need to file the edges of the cut side to smooth them over. Then I needed a quick way to temporarily attach it to my fence. 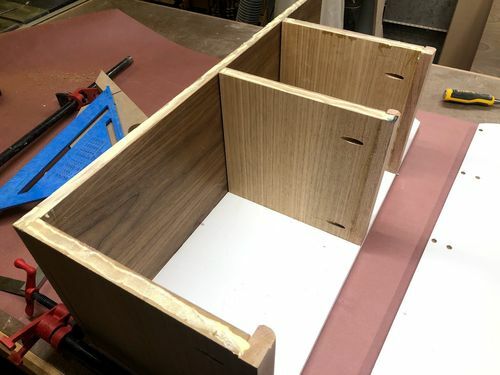 I decided to use three 3/4" flat-head screws that would slide into the middle slot on the back of the extrusion, and into a piece of nice flat PVC "board" of roughly the same size. 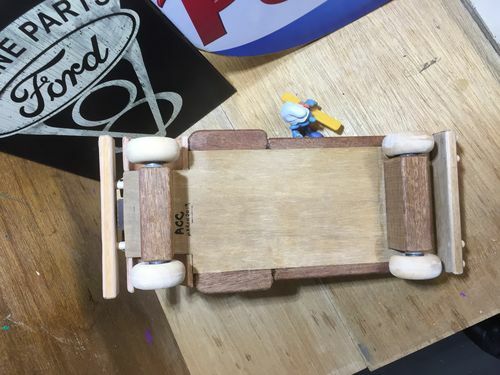 I counterbored three holes on the back side of the board, so that the bolts just poked through, and I could get a washer and nut on each one, and they were still below the surface of the board, so that it would sit flush against the fence. 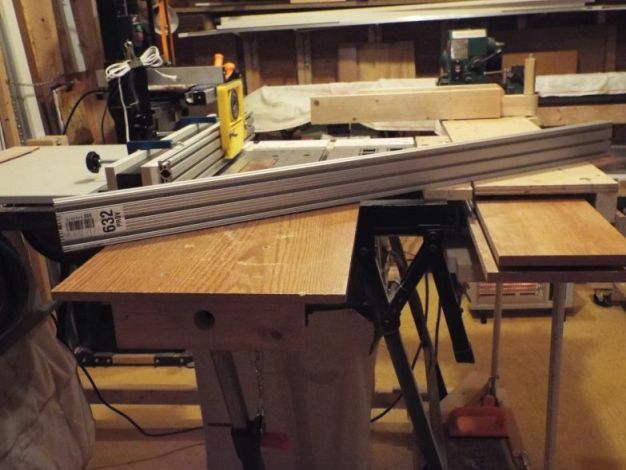 Then I used universal fence clamps to attach the pvc/extrusion combination to my table saw fence. I couldn't be happier with the final outcome, and I'm still pondering what cool things I can do with the rest of the extrusion. I'll post anything new that I do as well. 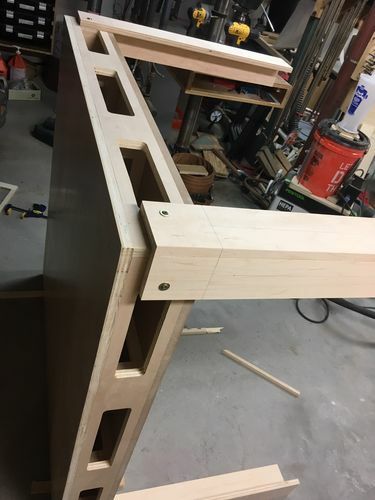 Made this step for a house I no longer own. 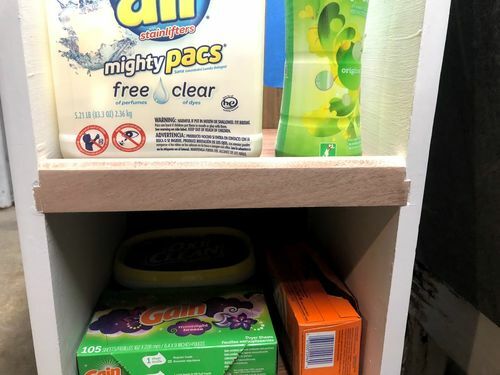 Made it in “mahogany” (sapele I think) so I would not have to maintain it.At the very moment we were leaving the house to move out of state, I yelled “Oh… WAIT!” and I ran over and grabbed the step. I plan to break it down and repurpose the wood!Still, this was a sturdy and useful piece when in use. Left outside in the weather (lake effect snow, etc.) and it always had a nice warm feel to sit on it. Finished with teak oil (whatever that is) and it held up real nice without ever needing refinishing. Used stainless screws to hold it together, but it was unnecessary because everything is still tight as a drum from the titebond III. When people really want to grill, but they don't really want to grill, they make kebabs.For me, when I really want to work in my shop but I don't really want to start a whole thing, I try to use up the bits and pieces of project ply kicking around.This time is was for a beer can caddy. (Most caddies aren't designed to accommodate macho pint cans. )Made three like this. 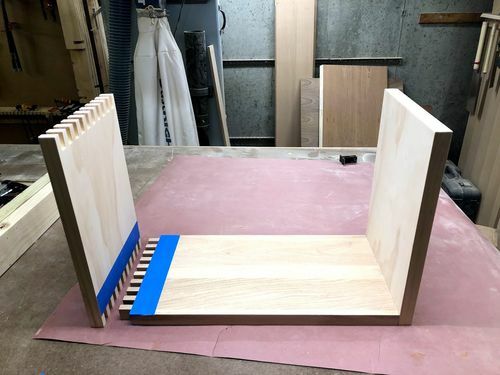 Half in ply and nails! Very sturdy. Finished with chalk board paint.Still trying to identify worthy recipients of the other two I made. 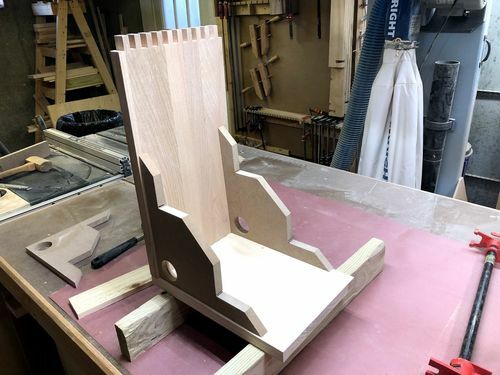 Book holder or stand made of one small piece of cherry. Super easy and basic design. Would make a decent gift if batched out. It could also be modified and become an ipad or tablet holder. Daughter wanted a couple of bedside tables. 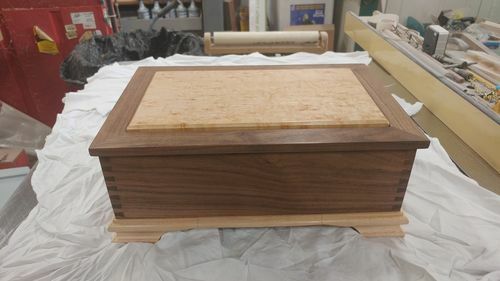 Had this walnut stored since 1982, and finally got my shop up and running, so this was my first project. Used Old Masters Blended Tung Oil Varnish. walking stick i made for my wife from a wood dowel and wrapped paracord handle. 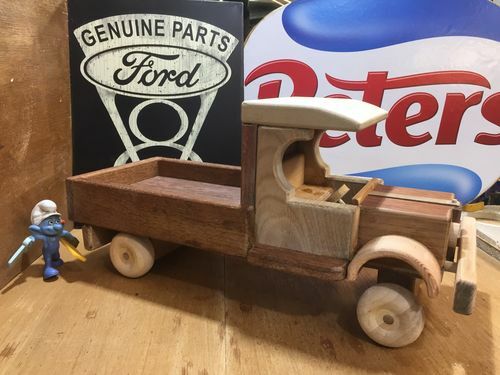 1920's Ford “C” Cab Farm Truck for a little boy's first birthday.After seeing the Ford “C” Cab Farm Truck I made for the local boys & girls club Easter Guessing competition our youngest daughter asked if I could make a similar but smaller version for Asher's cousin Sammy's first birthday.I had the pattern for the “C” Cab so it wasn't too difficult to scale down the farm truck to a smaller tray back truck with not too much extra detail to ensure it's playable for a little bloke. 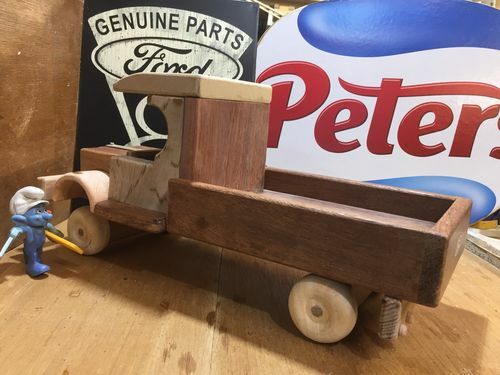 The timber is a mixture of Merbau, Spotted Gum, Blackheart Sassafras with Beech Wheels while the finish is my home made Wipe On Poly. 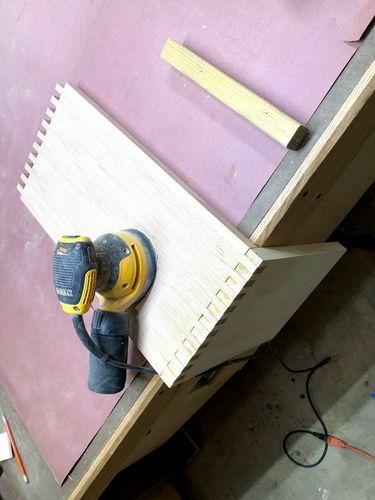 Added these plywood drawers underneath my table saw extension table after I got tired of walking around my Saw to the other side of the shop every time i needed a push stick, blade, jig or feather board. 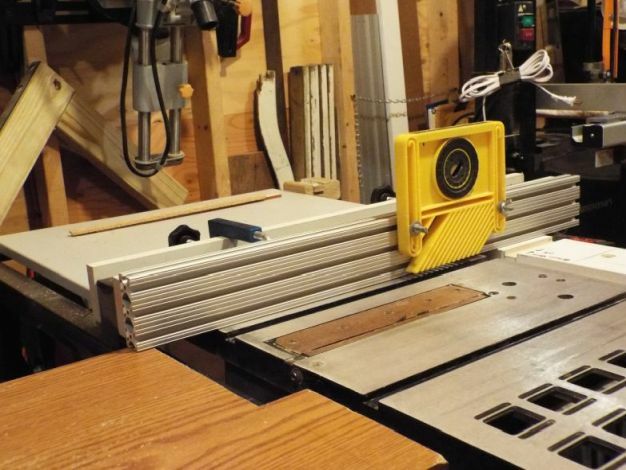 Now, all the things I need for my table saw are right next to the saw. No telling how much time I save with those things closer at hand! 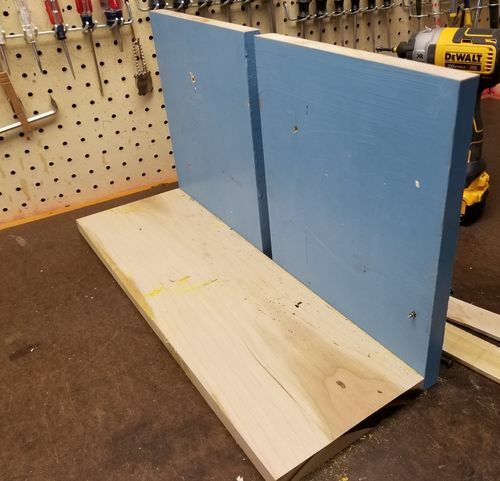 This is a 24 x 36 panel sled was made to trim the edges on a large laminated desktop for a desk I was making. 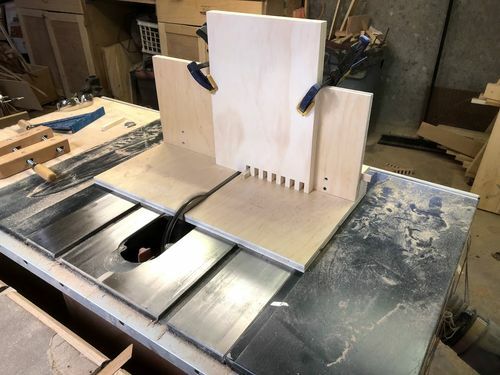 I closely followed the Sled design by Frank Howarth illustrated in his YouTube video entitled Big Table Saw Sled (see https://youtu.be/4p0UTVUXh48). 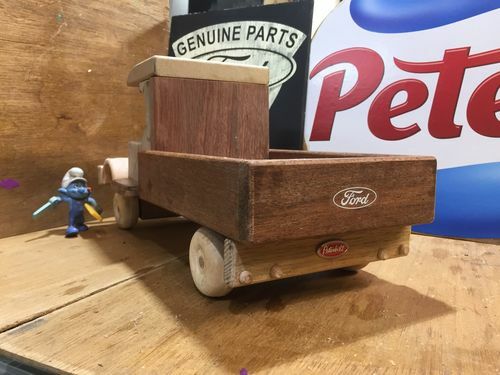 The Sled is made from 1/2 Russian birch with an oak fence and has some unique features in that it rides in only one miter slot and has only one fence on the front of the Sled rather than the rear. 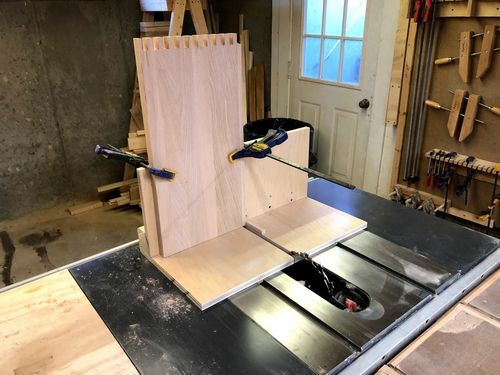 These features, along with two mounted hold down clamps, allow the Sled to be used with very large panels. 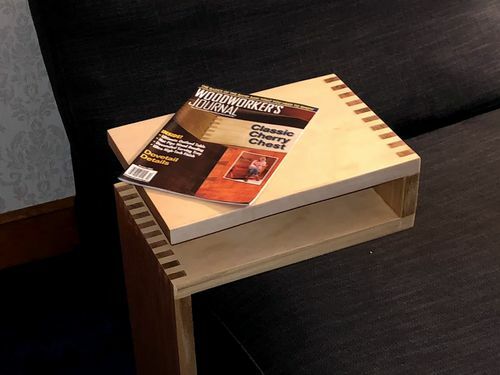 This desk was made from the plans given in the article Providence Writinng Desk by Mario Rodriquez in Popular Woodworking April 2009 issue #175. The Desk is made from true Honduras mohogany exported before Honduras stopped exporting Mahogany. 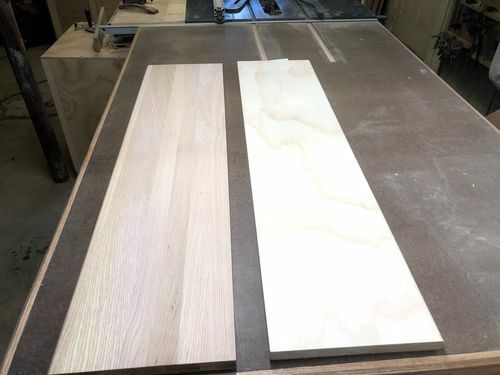 The drawer runners and guides are made from hard maple. 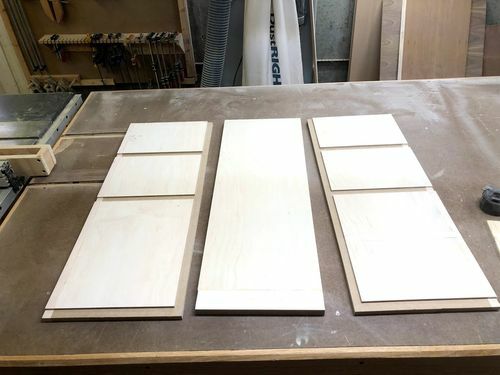 Floating drawer bottoms are made from 1/4 russian birch plywood.Finishing was accomplished by first sanding with 80, 120, 150 and then 220 grit sandpaper. Then, per the authors direction, a coat of sanding sealer was applied and rubbed out using #0000 steel wool. Then I applied 3 coats of clear satin brushing lacquer. Then, I sanded very lightly with 600 grit wet/dry sandpaper and rubbed the desk out with wool lube and #0000 steel wool again. Finally, a coat of Minwax finishing wax was applied. Completed a grouping with this latest bowl. I made these solid cedar wagon wheel bench seats for a local restaurant. Still going strong after several years. Been awhile since I've posted, but here we go. I've spent a lot of hours this week working on my largest ever (86 pieces) segmented salad bowl. Walnut and cherry. It's 14.25×6.25. 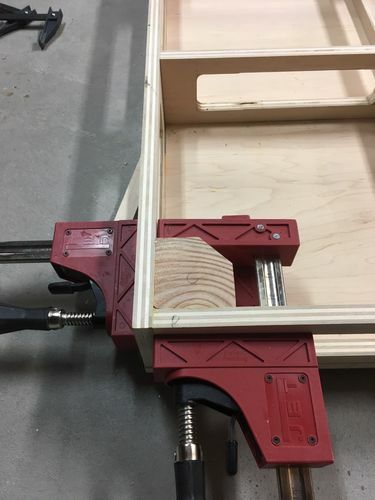 I did use for the first time the ”miterset” jig to cut all my segments and it worked great. My new Jet 16/32 drum sander was great for getting the rings nice and flat. Almost done just hoping I can use my vacuum Chuck so I can finish the bottom. What I found interesting was the color variations in the walnut, considering I cut it all from the same slab. 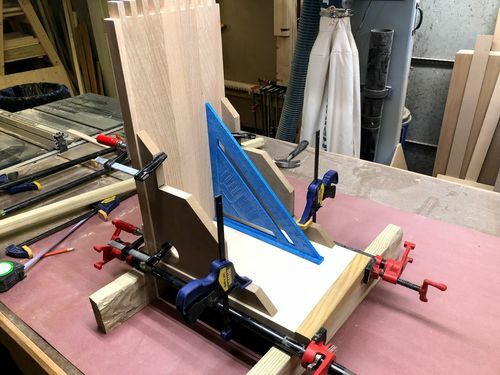 First mistake I made – when I created the glue block with a tenon my tenon was much too small to handle a bowl this large. 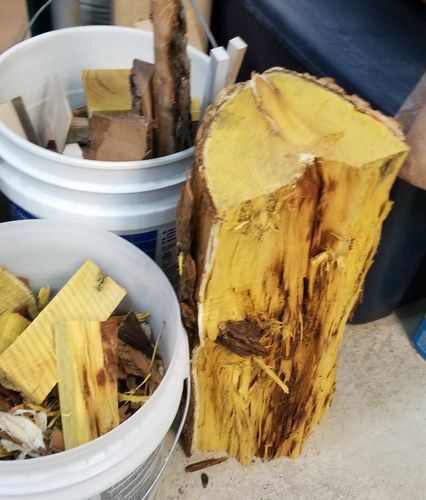 I sort of anticipated this and had already turned a new larger tenon in the bottom, it did snap off sending the 1/2 finished bowl to the floor. 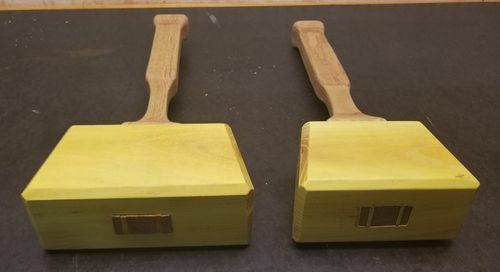 Once I got it re-chucked on the larger tenon I was able to continue but did have to redo the outside to remove some dents and scratches. I used General Finishes Salad Bowl finish, 3 coats with 600 grit sanding in between. This will be a food safe finish in about 30 days once completely dry. Quite happy with the end result. After posting my Chess Board, Wayne suggested some turnings so here they are. The whole set was put together as a set for my son. Cocobolo chess box with curley maple highlights. 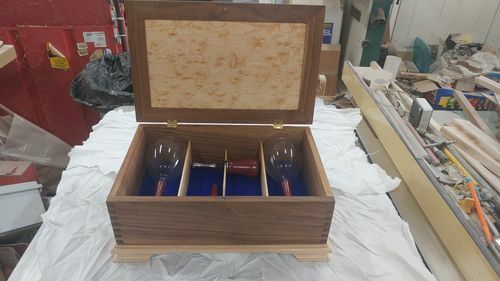 Inside the box, turned curley maple and claro walnut pieces with 24K gold highlights and bases. 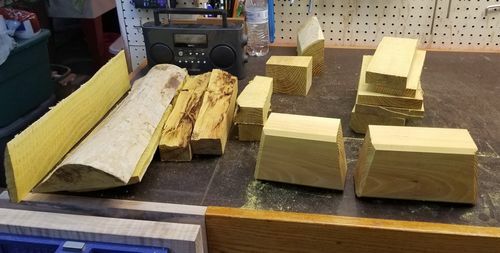 Just a few minor turnings from scraps of oak & purple heart.